Worry not about the Malays going “AMOK”…good will prevail over evil. Friends…do not concern yourself too much with what this Idiot may or may not do before, during and after PRU 14. For sure we must be apprehensive as to his intent and on guard as to his motives in the things that he does in the name of national security and government but do not trouble yourself too much as to whether this Idiot will or will not declare a national emergency should the vote tally indicates that Umno and BN will lose PRU 14. Let me tell you why you should not. The very act of thinking so will already mean that you believe that this Idiot is capable of doing so – declare an emergency and have all the government functionaries – including the Army – fall behind him and do his bidding. You believe that government servants in every state, in the Federal Territories and in every race, religion shape and form will unquestionably bow down to this Idiot demand that they now serve not King and Country but him! And you believe that you and me and the millions others who are with Pakatan Harapan will simply lock our doors and not venture out to protest and demonstrate their ire and anger at what is being done to their nation until that same Idiot allows them to do so. This is not May 1969. In May 1969 all it took was for a handful of Malays and Chinese to act and our Nation was plunged into a racial discord that killed many many Malaysians. And when the killing and the burning started the government could do what they thought they should do, tell us what they think we should know and imposed upon us all a locked down so that “law and order” could once again be restored. I was in London then and what I saw and read in London of May 13 was more than what any Malaysians saw and heard of the same incident. And after May 13 what Razak did was what Razak had always wanted to do and so begun those infamous terms “Bumiputra”….the Malays inalienable right…and all those other “Malay rights” and pro active policies that have been abused by Umno to profit itself…not the Malays. Fast forward to today and ask yourself what would happen if that Idiot declares a National Emergency that would required for him to rule by decree? Who will inform you of any “berita terkini?”. Who will tell you where Tun Mahathir, Kit Siang and the others who are our leaders in Pakatan Harapan are regrouping and marshaling their forces to do battle with the Umno led BN illegal government? 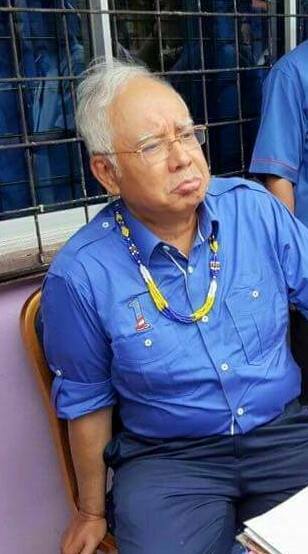 Who will tell you of the instructions being relayed by our leaders in Pakatan Harapan to all those who are with them as to what they want us to do, how to protest and what to do to activate our protests against that Idiot whom we all know has already lost PRU 14 and is now only doing what he must do to stay out of jail? How will Tun Mahathir and Kit Siang rally the troops and this time march again towards Putrajaya and take from the Idiot what is rightfully ours that was won at PRU 14? The Net will. Twitter and Instagram will. Blogs, face books …social media will. And there is nothing more powerful, nothing more decisive and more effective then social media to turn the Rakyat against a corrupt and arrogant Idiot led BN that has already lost PRU 14 and that is totally at sea in understanding the position it now is in – that of being totally rejected by any sane, rational and responsible Malaysian. All that social media needs to trigger that force is the ire, anger and disgust of our people should that Idiot tries to win and election he has already lost. Imagine how much more powerful and total People’s Power in the Philippine would have been able to rid itself of Marcos if the Net was available for the people to use then?. We have seen time and time again in the Middle East and in the developed nations how persuasive the Net can be in moving people and ideas into the realms of realities and from there shaped ideas and ideals into something tangible….tangible enough for the powers that be to understand that when the people are moved to do things….nothing will or can stop them. If truth be told…I cannot wait for that Idiot to even begin to think that he can win an election he has already lost! Will he let loose Jamal Jamban and his hoards of Red Shirts upon all of us? Yes he may. And the Malays, docile as they may be, can work themselves up into a frenzy…into that state we all know as “AMOK”. Yes for sure we know that for dedak Jamal Jamban and his hoards of Red Shirts can work themselves into a frenzy…but ask yourself this! Have Jamal Jamban and that Idiot ever considered the other Malays who can also work themselves into a frenzy? Not for dedak but in the fight for their family, their future and for other Malaysians and Malaysia? Which one will emerge victorious? The fight for dedak or our fight for our family, our future, our Malaysia and for all Malaysians. It is a no brainier….Jamal Jamban and his hoard of Red Shirts will be chased shelter skelter into the Gombak River in no time. Think of all the possibilities. Think what would happen if that Idiot tries to grab back an election he has already lost. No my friends I do not worry about that happening. So perish that thought and do not work yourself up into a wreck thinking about “what if”. We will write our own destiny. We will vote into office our own government…and as sure as the sun will rise again tomorrow….we will prevail! By Hussein Abdul Hamid|2018-07-14T05:44:02+08:00January 21st, 2018|Categories: Uncategorized|Tags: jamal jamban, Najib, PRU 14, rakyat|Comments Off on Worry not about the Malays going “AMOK”…good will prevail over evil.